The Arch-Mage's Quarters is the area within the College of Winterhold in which its current Arch-Mage resides. All of the items found in the room are marked as owned and taking any of them is considered stealing until you become the Arch-Mage, although taking them in plain sight does not incur a bounty. Good Intentions: Find and consult the Augur of Dunlain. The Arch-Mage's quarters are located at the top of the tallest tower in the College of Winterhold. The quarters are locked until the quest Under Saarthal has been completed. Prior to that point, the Arch-Mage, Savos Aren is either in the central courtyard of the College of Winterhold (night) or just inside the door to the Hall of the Elements (day). It is an dodecagonal room (twelve-sided) with an antechamber and central garden containing various plants and fungi as listed below. There is a curved partition stone wall separating the sleeping area from the garden and the rest of the room. There are many different rugs on the floor around the outside of the room. 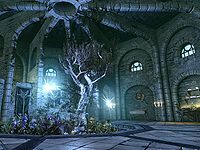 The antechamber is an open empty space with a long wooden bench against both of the side walls with two College of Winterhold banners hanging above and a large rug on the floor. There are two entrances with stairs leading up from the antechamber in front of the Hall of Elements and the Arcanaeum. Both of the flights of stairs continue past the antechamber to an exit to the roof of the tower. However this cannot be used as an additional entrance as there is no way to access this from the outside. On your left as you enter the main part of the room is a square wooden table and two chairs. There are many mounted animal heads and skulls on the outer wall around the room including bears, wolves and sabre cats. Beyond this is an alchemy lab with a set of shelves on either side and two further sets to the right holding various ingredients, potions and poisons. Several barrels and baskets containing further ingredients are also in this area of the room. Continuing around the room to the left several more sets of shelves holding a selection of random items all listed below. Coming out from a wall to the northeast is a good quality double bed with small tables flanking it. To the right of the bed are two small wardrobes with one tall wardrobe between them, these all contain a selection of random fine clothes, fine boots, loose coins and items of clutter. On the right-hand small wardrobe is a dagger display case containing a Dwarven Dagger. There is a large round table and chair against the next wall section to the right with a wash basin beside it. To the right of this is a large display cabinet containing several soul gems listed below. Next to this is an arcane enchanter with two wall shelves above holding several more soul gems. The final outer wall section before completing the circuit back to the antechamber has another square wooden table and two chairs. The curved partition wall starts opposite the second section with sets of shelves against the outer wall and continues around to opposite the large display cabinet. There are several food sacks and a barrel by the start of it, a small table and two chairs against the first section, followed by a safe and then a long unlocked chest opposite the double bed containing random items. Then another square wooden table with two more chairs, and finally an open crate on the floor with a wall shelf above. There are three College of Winterhold banners hanging from the inside (facing the garden) of the partition wall. There are small semicircular windows high up on each of the twelve sections of wall; except the section from the antechamber which has a large circular window also high on the wall, and is lead-lined with the College symbol. Although the quarters themselves respawn every ten days (necessary for the alchemy garden to regrow), all the containers inside are safe for storage. The quarters are also locked until you speak to Tolfdir during the quest Good Intentions. Sleeping in the bed as Arch-Mage will not result in being well rested. Taking some items in chests while Arch-Mage may still count as stealing. ? This page was last modified on 28 September 2016, at 07:25.